GEORGE TOWN: Malaysia’s first Mount Everest conquerers N. Mohanadas and M. Magendran have been conferred Datukships in conjunction with the Yang di-Pertua Negri Tun Abdul Rahman Abbas’ 72nd birthday celebration . The two, who reached the peak of the mountain in 1997, were among 47 individuals who will receive the Darjah Setia Pangkuan Negeri (DSPN). Heading the Yang di-Pertua’s list is Armed Forces chief Jen Tan Sri Azizan Ariffin who will be conferred the Darjah Gemilang Pangkuan Negeri (DGPN), which carries the title Datuk Seri. The other recipients of the award are former Penang Development Corporation (PDC) general manager Datuk Chet Singh and Health Ministry’s former senior consultant Datuk Dr Lim Yu Hoe. Nine people will receive the Darjah Yang Mulia Pangkuan Negeri (DMPN), which carries the title Datuk. 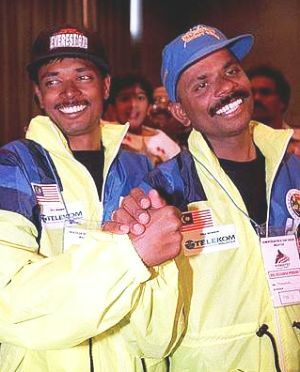 High achievement: M. Magendran and N. Mohandas seen savouring their successful climb to the peak of Mount Everest upon their return to Kuala Lumpur in this 1997 file picture. They are former Gerakan leader Dr Goh Cheng Teik, Penang Deputy Chief Minister I Mansor Othman and Tourism Ministry secretary-general Datuk Dr Ong Hong Peng. The others are businessman Datuk Abdul Rafique Abdul Karim, Malaysian Financial Planning council member Datuk Ahmad Rodzi Pawanteh, Lt-Jen Datuk Wira Allatif Mohd Noor, businessmen Tan Sri Lim Ewe Jin and Datuk Dr Ong Kean Lee, and Penang Council of Datuk-Datuk president Datuk Markend Dalpatram Joshi. Among others getting the DSPN are former Bar Council president Yeo Yang Poh, St Xavier’s Institution in Penang Brother Di-rector Charles Levin@Brother Karl Wolff and urban planner Dr Goh Ban Lee. Others include Penang deputy police chief SAC I Datuk Tun Hisan Tun Hamzah, Penang CID chief SAC II Wan Abdullah Tuanku Said, former Berapit assemblyman Wong Hang Yoke, Penang PKR secretary Senator Mustafa Kamal Mohd Yusoff, Penang State Assembly deputy speaker Tan Hock Leong and former Penang Hindu Endowment Board secretary K. Bala Singam. A total of 186 recipients will be conferred the Pingat Kelakuan Terpuji (PKT), 337 for Pingkat Jasa Kebaktian (PJK), 150 for Pingat Jasa Masyarakat (PJM) and 84 for Pingat Bakti Setia (PBS). The Star news editor (Penang) Eddie Chua receives the PKT while Malaysian Nanban reporter T. Mathews receives the PJK. The Star circulation executive N. Thanaventhiran receives the PJM.